One of the best "pre show" areas in all of Walt Disney World has to be the one at Muppet*Vision 3D in Hollywood Studios. There are an amazing number of props to be found here. In true Muppet fashion, there are gags everywhere. I definitely recommend taking the time to walk around the room to look at everything you can. Pay particular attention to the words written on the crates as they are usually very funny. I have been away on vacation so it has been several weeks since my last "modern technology" posting. Also, this being my 100th article, I decided to feature a significant app put out by Disney Parks themselves. 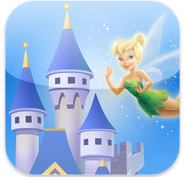 There are many great mobile phone apps available related to Walt Disney World. I have reviewed many of them here on this blog. You can find everything from wait times, to attraction descriptions, to dining information across several different phone platforms. As great as some of these apps are, most of them are "unofficial" and are not affiliated with the Disney Company. However, Disney has thrown its hat into the smartphone arena and has created a very useful tool for your handheld device. Disney Mobile Magic is the "official" Disney Parks app. Although it was just released last week, it really isn't fair to say that it is new. There was an earlier version available to Verizon customers on a limited number of cell phone models, including Androids. This new version was created for the iPhone, and is now available to all iPhone and Android users. However, due to its partnership with Verizon, customers of that provider have access to some premium videos and games within the app. So, what does Disney Mobile Magic offer to us smartphone users? 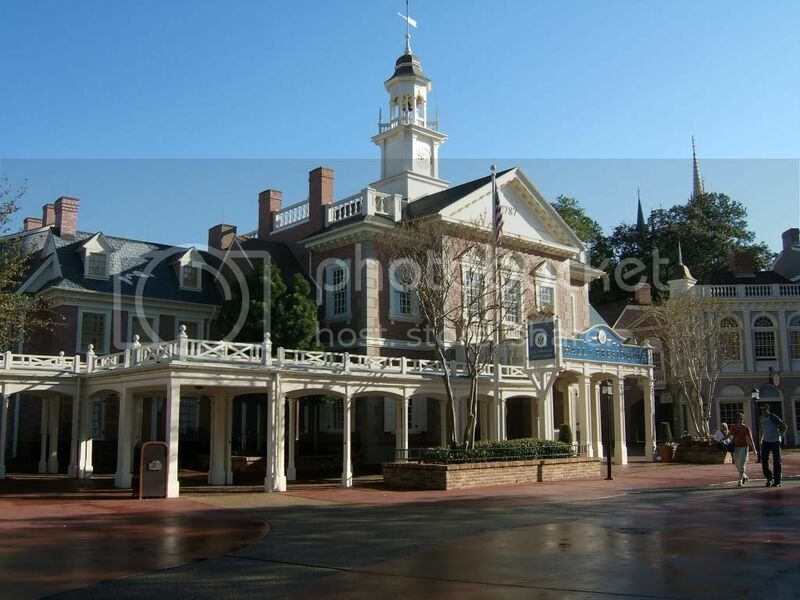 Simply put, it provides us with "official" Disney parks information at our fingertips. First and foremost, it gives us official attraction wait times and FASTPASS return times that come from the same system that provides this information in the parks. This is an amazing advantage over other wait time apps. Although many third party apps give accurate info, they rely on historical data and "user reported" times from within the parks. For this reason, other apps can only give estimated wait times. One interesting note about Disney Mobile Magic is that to get the specific times, you need to physically be in that park (verified by your GPS). If you access this section of the app from outside a park, you get general descriptions like: See Now, Moderate, or High Demand. In addition to wait times, Disney Mobile Magic gives complete descriptions of each attraction, as well as their locations on an interactive map. This section also allows you to filter the attractions by categories, such as thrills, FASTPASS available, and character experiences. Of course, you will also find park hours and entertainment schedules as well. With a tap of the "set reminder" button, you can tell the app to alert you one hour prior to a show or parade that you might want to attend. You can also set "favorites" by simply tapping the star button next to an item. This way you can be sure that you don't miss any of your "must do" attractions. 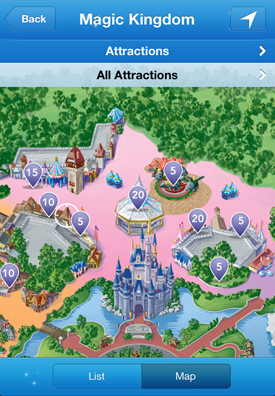 A unique area of the Disney Mobile Magic app falls under the the "Characters" tab. This section tells the story of each character that can be found in the parks. It includes a button that links that character to his or her "friends." There are several category tabs to find your favorites, or you can simply type the character's name in the search window. 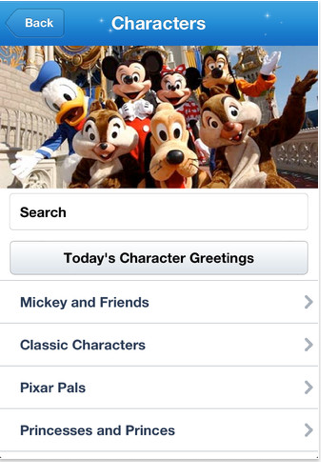 Finally, there is a button for "Today's Character Greetings" to let you know times and places to find them in the parks on that day. 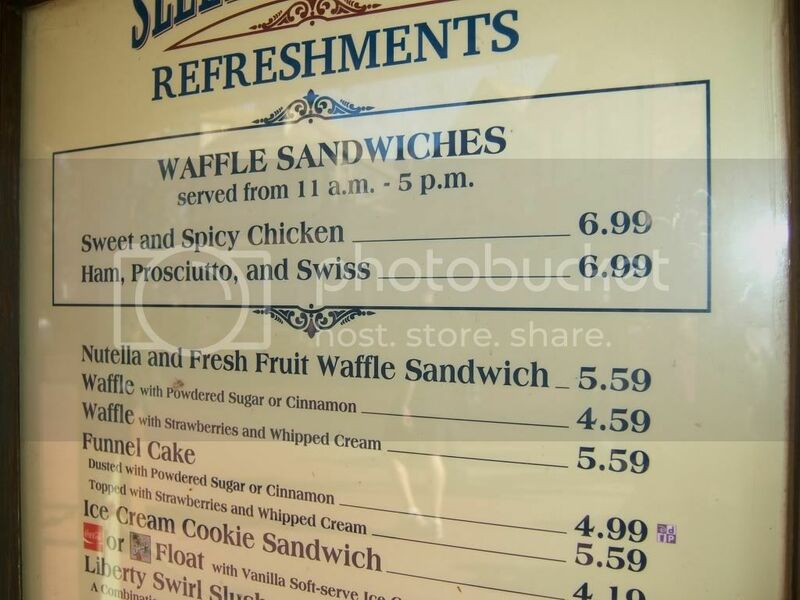 For those of us who love to eat our way around Walt Disney World, we certainly like to have restaurant info readily available. When it comes to dining, the Disney Mobile Magic app doesn't disappoint. It includes descriptions of every food location on property. You can also tap a button to see the location on an interactive map. In addition to general information, may of the restaurants list price ranges and even menu items. 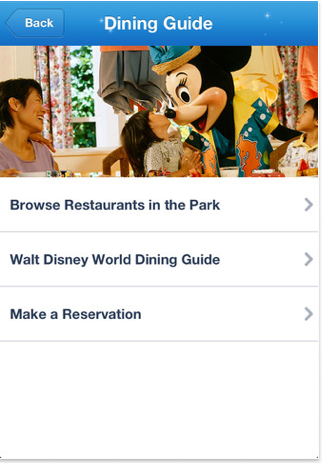 The best part of this section, however, is the ability to make a dining reservation (ADR) right from the app itself. This is a great feature, especially to check for last minute availability without having to make a phone call. The final area in the Mobile Magic app is labeled "More." This has to be one of the most comprehensive "More" sections that I've ever seen in an iPhone app. It starts out with a "Weather" tab that gives you current conditions and the five day forecast for the area. The next tab brings you to the "Shopping" section and gives you detailed descriptions and map locations for all of the stores in that park (my wife's favorite part of the app). After shopping, you will find the "Games" tab. This brings you to the Disney Parks Trivia Game which allows you to compete against other Disney fans to see how much you know. Warning: this game can be addictive! The next tab shows the locations of guest services, such as restrooms and baby care centers, on a map. Although it is nearly hidden towards the bottom of the "More" section, the "Transportation" tab is one of the most useful areas of this app. You can enter two locations anywhere on property, and this section will tell you the best way to travel between them. This is particularly helpful when traveling from one hotel to another. Finally, the last tab is the "My Vacation Details" tab which allows you to store your personal trip info like dates, hotels and reminders. Needless to say, all smartphone users should download the Disney Mobile Magic app immediately. It combines information that you would previously need three or four different apps to obtain. 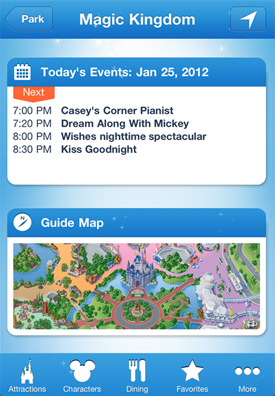 It is all "official" information and this one app contains both Walt Disney World and Disneyland. Oh, and I should probably also mention that it is completely FREE! This shot in the queue line for Pirates of the Caribbean shows another great example of how detailed the "waiting areas" are for most Walt Disney World attractions. The typical amusement park will have basic lines to wait in, where guests will traverse back and forth between metal railings. There might be a few posters on a wall or some background music playing. However, Disney typically immerses their guests into three dimensional "sets" that make them feel like they are part of the story. They also stay true to the story as you can see here. On a barrel of gunpowder you see the word "Explosivos." It makes sense that the writing would be in Spanish as the setting of the attraction is a Spanish fortress. Here is an early morning shot of the Hall of Presidents from our trip in January. It is always interesting to see the wet roads right after the park opens, even though it hadn't rained. Every night the streets are washed by cleaning crews so they are in pristine condition for the next day's guests. Also, notice the number atop the front of the building. The 1787 represents the year the United States Constitution was written. 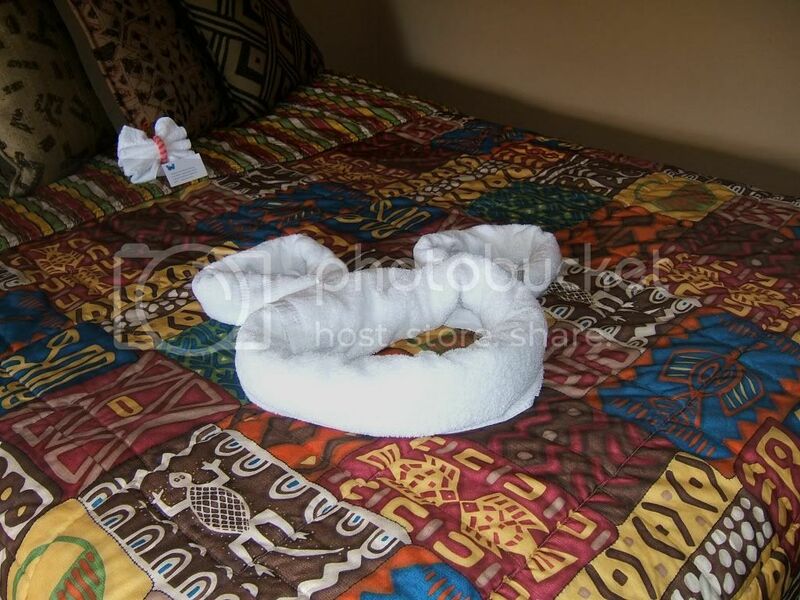 Although this shot was taken on our January trip at Kidani Village, towel animals are certainly not limited to this resort. Most Disney housekeepers are skilled in the art of linen "origami." You see Mickey depicted in this picture, but they create many different surprises out of nothing but hand towels and wash cloths. It is fun to come back from a long day at the parks to see what may have been made while you were out. This is also a common practice on the Disney Cruise Line. This picture is from Walt Disney: One Man's Dream at Hollywood Studios. It is a full size replica of the TV studio where Walt announced his plans for the "Florida Project" to the world. The actual event took place in Orlando on November 15th, 1965. 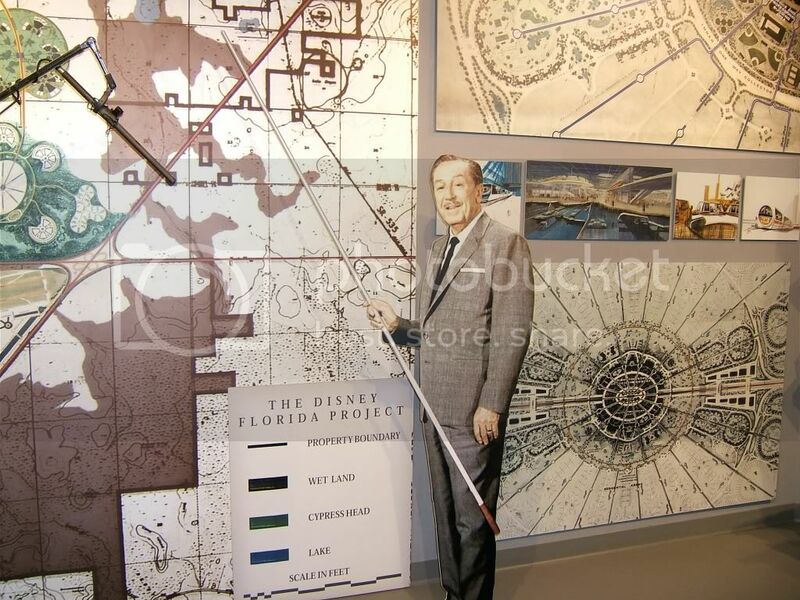 Although he is just a cardboard cutout in the exhibit, it does capture the spirit and enormity of what Walt was planning for the area. As I've said many times in the past, Walt Disney: One Man's Dream is a must see when you visit this park. This shot from last summer was taken in the Toy Story section of the All-Star Movies Resort. The larger-than-life icons make this a fun place to stay or even just visit. Even though we weren't staying at this resort, we knew our little man would enjoy checking it out. 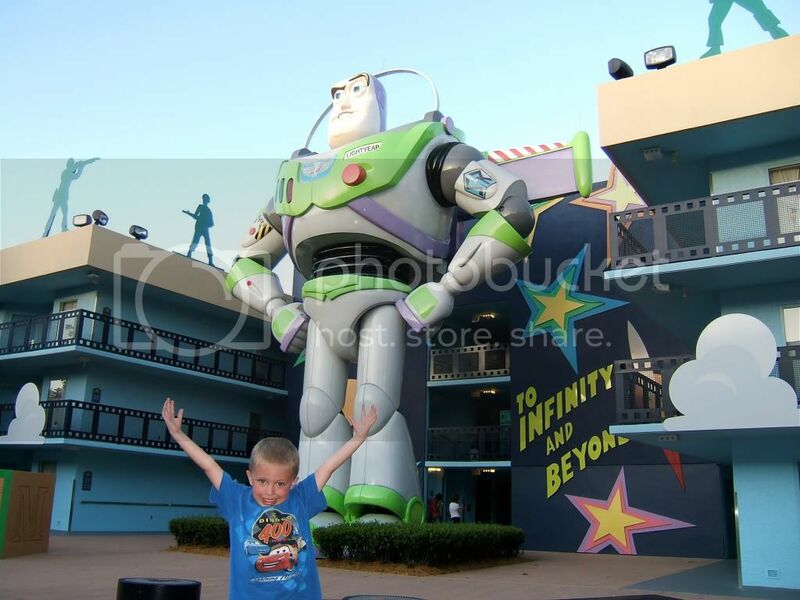 When asked how big Buzz was, he responded with "this big" and showed us with his arms. Along with Buzz, there are also huge versions of Woody, Rex, and several other characters from the beloved Pixar films. 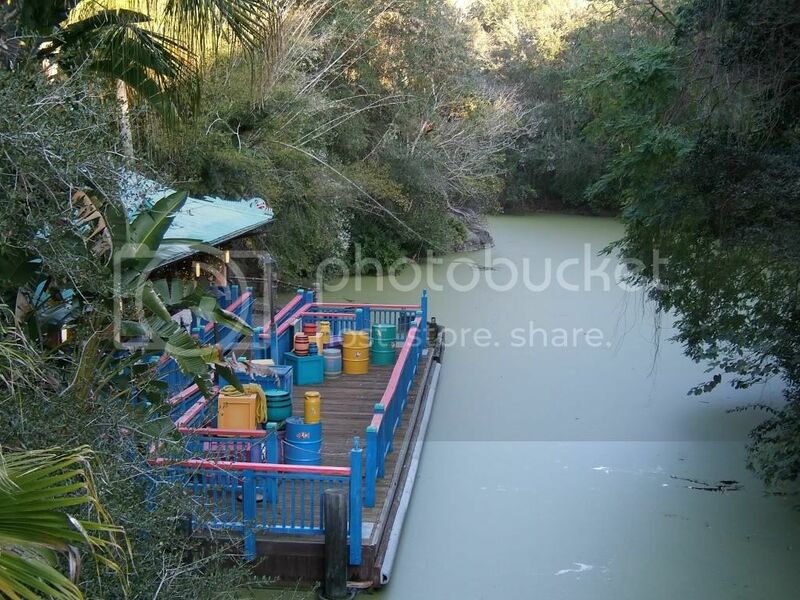 This picture of the main waterway through Animal Kingdom was snapped on our recent January trip. The dock was the loading area for one of the parks original attractions, the Discovery River Boats. This dock is now used as a character meet and greet area. The boat ride only lasted for about one year. Due to long waits and the lack of substantial scenery, it closed in 1999. However, some of the original vessels have recently returned to service as transportation on the Seven Seas Lagoon. This shot was taken from the upper floor of The Land. This huge pavillion is home to some great attractions, including one of the most popular in all of Disney World, "Soarin." In addition to Soarin, there is "Living with the Land", which can be seen in the bottom right corner of the picture. On the upper level is the "Circle of Life" movie, which is an entertaining look at conservation and the environment. Besides the fun attractions, there are many good dining options in The Land. Finally, I would like to point out an often overlooked detail about this pavillion. 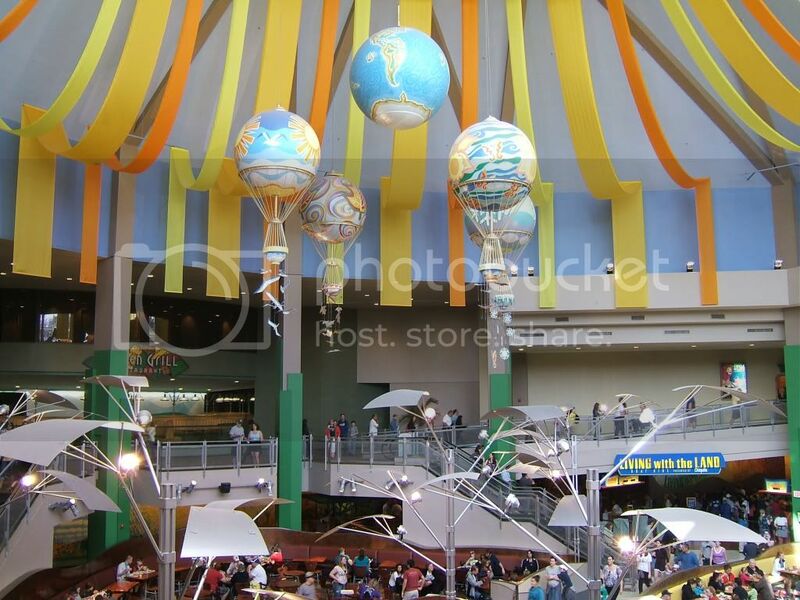 If you look at the four large balloons hanging from the ceiling, you will see that each one depicts a different season. This is the first time I've posted a picture of a snack bar menu, but after eating at Sleepy Hollow Refreshments in January, I felt it was warranted. I have recently become a fan of Nutella, and when I saw they were offering this delicious spread on a waffle, I couldn't resist. Although I'm not a huge fan of fruit, this wonderful hazelnut concoction overshadowed any "healthiness!" Sleepy Hollow Refreshments is located in Liberty Square, right over the bridge from the hub. I highly recommend stopping by on your next trip. Here is another shot from my favorite attraction. There are some interesting details around the front door. First, you can see that the pillars are actually coffins. Also, the flower pot on the right is a cremation urn. Finally, if you look closely at the door itself, you will see a black wreath hanging on it. This signifies that a serious illness or death has overtaken the home. These are details that are most often overlooked by Magic Kingdom guests. 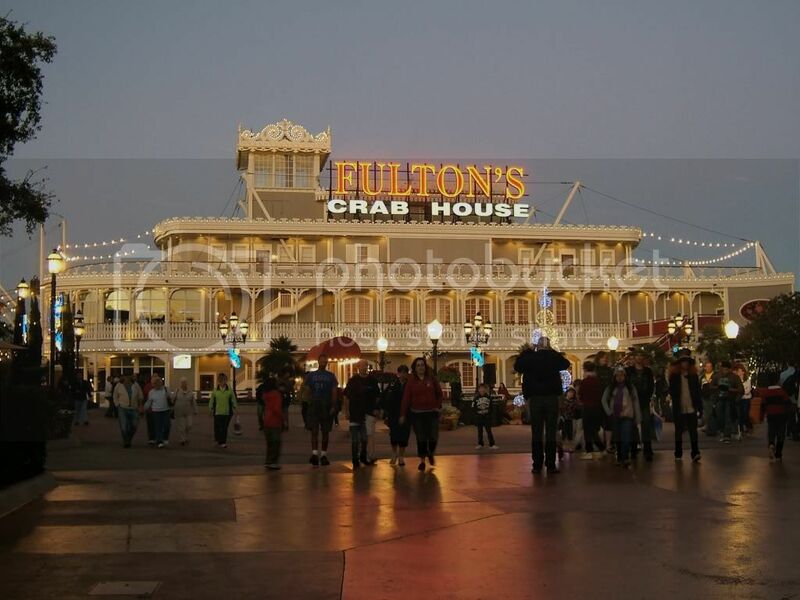 This shot of Fulton's Crab House was taken right around sunset. Originally known as the Empress Lilly (named after Walt Disney's wife), this gigantic river boat is home to the finest dining at Downtown Disney. The truth is that as much as it looks like an actual boat, it was built on a huge slab of concrete and has never moved from that spot. There use to be a moving paddle wheel on the back and even smoke stacks, but they were just part of the Disney "show." This shot was taken in Frontierland early in the morning. We are looking west from the area in front of the Country Bear Jamboree. You can see Pecos Bills Tall Tale Inn and Cafe at the end of the street, which serves one of the best burgers in all of Walt Disney World. The street number of 1878 is significant as it represents the year that this area is supposed to depict. 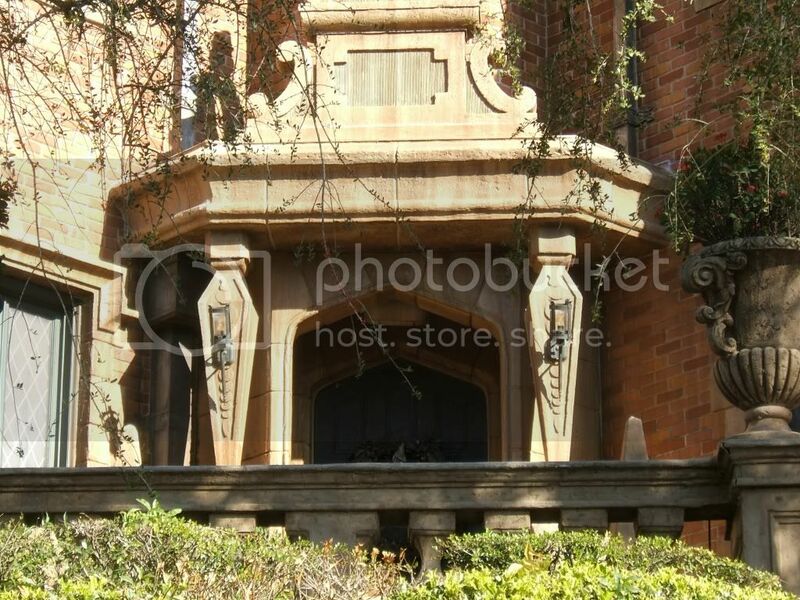 The other street numbers in Frontierland were chosen in a similar way to also represent the late nineteenth century. This is another one of those often overlooked details that can be found in the Magic Kingdom. This is another shot taken during Marathon Weekend at the 5K, while running through Epcot. It was great to see the "Big Cheese" himself posing for pictures. The only negative about stopping to get photos with the characters is that it obviously slows down your pace. For amateur runners like myself, this certainly isn't an issue. However, if you were looking to actually "compete" in the race, it would not be advisable to stop for too many character shots. This photo of a "statue" was taken in January in front of the old BET Soundstage Club at Pleasure Island. We soon realized why there was a crowd gathered around it. Every few minutes, the statue would move and change poses. This was obviously a well decorated actress who had an amazing ability to stand extremely still! This shot of a cuckoo clock was taken in April of 2010 while riding The Many Adventures of Winnie the Pooh in the Magic Kingdom. If you look closely, you'll see a Hidden Mickey painted on the little door. This is by far one of my favorite Hidden Mickeys in all of Walt Disney World because it is only visible if you light it up with a camera flash. This clock is in a very dark spot, and the Mickey cannot be seen with the minimal lighting in the area. Of course Disney frowns upon flash photography on dark rides, but this one was taken specifically for research! One of my favorite things about being involved in the Disney online community is discovering people with similar stories. There are millions of Walt Disney World fans who come from all over the world. Many have taken their first trips as young kids and others have become hooked as adults. Sometimes, however, I find people like myself who really "grew up Disney." Does growing up Disney mean living in Orlando or being raised by Disney World cast members? Not necessarily. I feel that you fall into this category if you took your first trip at a very young age and returned on a frequent basis. Although we didn't go every single year, I certainly feel that I grew up Disney, as all of my family's major vacations were to that magical spot in the center of Florida. There is one more prerequisite to being a member of the "growing up Disney" club. You still must have as much excitement for this place as you did as a kid. This is certainly the case for Amy and her family who created GrowingUpDisney.com. The Growing Up Disney blog was started by Amy back in 2010. Her parents first took her to Walt Disney World as a preschooler and they bought into the Disney Vacation Club when she was in high school. While in college she was a cast member at the Crystal Palace while on the Disney College Program. Her wedding was at Disney World, and like myself, her honeymoon was aboard a Disney cruise ship. Although her husband (like my wife) isn't nearly the fan as Amy, he certainly supports her "habit" as they are raising their daughters to be the family's next generation of Disney geeks. One of the things that makes GrowingUpDisney.com unique is that it isn't written by just one person. Although Amy is the creator and biggest contributor, she is joined by her dad and her brother in putting out great content on a regular basis. Many people start blogs and they fizzle out after a few months. This is certainly not the case with this family as they have over 500 posts in just under two years. Like Digital Disney World, they are posting something almost every day, and they also include great photos with their articles. Another great feature of Growing Up Disney is the way that it is organized. Like most blogs, the most recent posts are on the home page in chronological order. There is also the standard "archives" in the left hand margin. However, Amy did a nice job of using tabs across the top to categorize some popular topics related to Walt Disney World. For example, you can read her dad's articles under the "Disney Vacation Club" tab or check out her brother's features under "Around the World with Ridge." Amy also assembled a team of moms who contribute their discussions under "Minnie Moms." Overall, this blog is very well laid out and professional looking. GrowingUpDisney.com is a fun site for all Disney fans to check out. For those of us who are raising third- generation Disney kids, it is simply a must read. Amy and her family really embody the spirit of what Walt desired when creating his theme parks. He wanted a place where moms and dads could enjoy spending time with their kids. It is obvious that Amy's parents embraced this idea and have passed it along to their children and grandchildren. 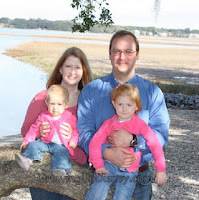 Although we may come from different parts of the country, I feel a connection with this family as we have a similar passion and we are also raising our son to "grow up Disney." This was the view we had from our table at Narcoossee's last July. This is a great restaurant located right on the Seven Seas Lagoon at the Grand Floridian Resort. We had a wonderful view of the Magic Kingdom, Contemporary Resort, and the Polynesian Resort. A nice feature of dining at the Floridian is that we were able to drop our four year old son off at the Mouseketeer Club for a couple of hours while we enjoyed a fancy dinner. This is a fun spot where kids can have fun playing with other kids in a safe, supervised environment. I highly recommend Narcoossee's for a very good dinner with amazing views. If you have kids, the Mouseketeer Club is a great option. This picture of the Enchanted Tiki Room building was taken from Adventureland. There is an interesting story as to how the "animals" were designed for the roof. 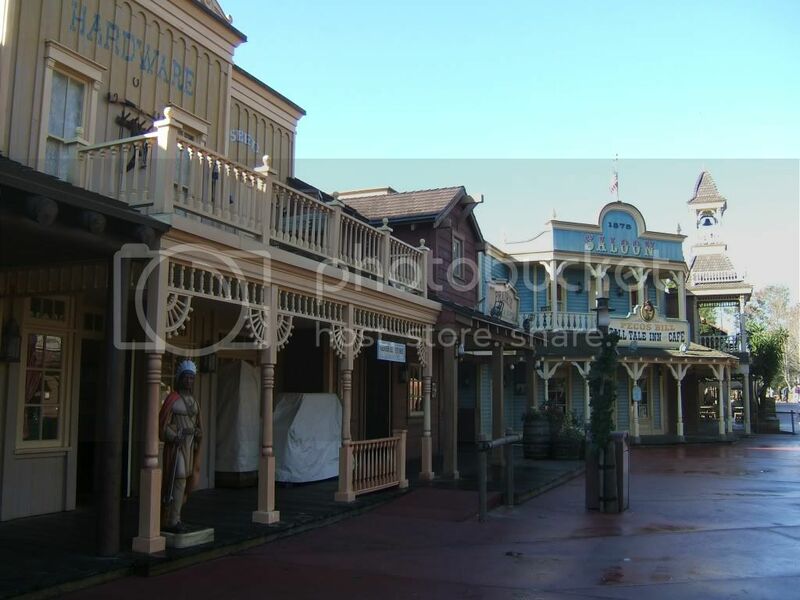 Because they can also be seen from Frontierland, they had to make them work for both areas. So they were made to look like Asian Water Buffalo for Adventureland and Texas Longhorn cattle for Frontierland. This is another example of how Disney always makes sense of the stories they are telling throughout the parks. Here is another fun "on-ride" shot from one of my favorite attractions at Animal Kingdom. Last month I posted a picture from the spot on Expedition Everest where the train stops and is about to drop backwards into the mountain. This picture is from the same ride, but at the top of the 80 foot climactic drop as the coaster comes hurdling out of the mountain. You can see the Asian village at the lower right and the Tree of Life poking up above the horizon. I took this picture for several reasons. First, I wanted to see if I could get a clear shot from the top of the drop, and second I wanted to give those of you who would never brave Everest (like my mom and dad) a feel for what it looks like to be on the attraction. Incidentally, Expedition Everest is the tallest mountain in the state of Florida at nearly 200 feet. This was the view from my hammock on the Polynesian Resort beach from a trip back in March of 2006. We were in a quiet spot toward the end of the beach. As you can see, there is a gorgeous view of the Seven Seas Lagoon from here with Cinderella Castle across the way. Although we weren't actually staying at the Polynesian, we spent the afternoon relaxing there. One of the nicest things about a Disney World vacation is the ability to enjoy any of the resorts no matter where you are actually staying. Along with the Contemporary and Grand Floridian, the Polynesian is an easy spot to get to from the Magic Kingdom as it is on the monorail line. These are all great resorts to escape to when the park gets crowded in the afternoon. Walt Disney said that his theme parks would always be changing and evolving and would not be a "museum." This is certainly true as new attractions are continually being developed and built. Often times, Disney takes current attractions and refurbishes or "pluses" them to enhance the guest experience. For those of us who make frequent trips to the Vacation Kingdom, this is welcome change as it is always fun to see new things. However, also being Disney nostalgics, we often miss rides that are closed or changed. Through the use of modern technology, many of the old attractions are preserved through blogs, websites, and YouTube videos. This week, an absolutely amazing video debuted that pays tribute to a recently updated classic attraction in Hollywood Studios. 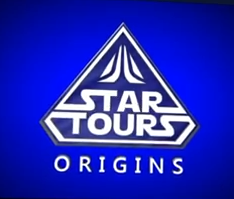 "Star Tours Origins" is much more than a simple ride video. It is a completely computer generated re-creation of the original attraction. It was created by an obviously talented independent filmmaker named Gregory Noacco, and was done independently of both Disney and Lucasfilm. He worked for over six months to create this masterpiece, which allows us to experience the first incarnation of Star Tours in video form. In addition to the actual movie, it also shows loading and unloading from a first-person perspective. It is available in two versions on YouTube. In addition to the standard 2D video, which is very high quality to begin with, Gregory also created a stunning 3D version. Click here to watch "Star Tours Origins"
The original attraction debuted out in Disneyland in 1987 and then in Hollywood Studios in 1989. It delighted park guests through 2010 when it closed for a major refurbishment. When the attraction reopened in 2011, it was renamed Star Tours: The Adventures Continue. 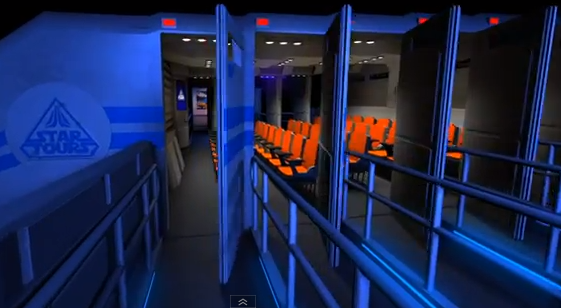 The new version is a technological marvel as it combines a motion simulator, 3D technology, and multiple scenes that change from ride to ride. There are 11 random segments which allow for 54 different possible ride experiences. This new version of Star Tours is fantastic, but there will always be a warm spot for the original. Up until now, we could only enjoy it by watching amateur home videos, but "Star Tours Origins" has changed that. Gregory's hard work has preserved this attraction for future generations to enjoy. This shot was taken near the end of the Walt Disney World Half Marathon last month. We were in the monorail passing over the entrance road to Epcot when I snapped this photo. The course takes participants from Epcot to the Magic Kingdom and back to Epcot. The runners pictured here were coming down the home stretch and were about a mile from the end of their 13 mile run. Many of them were walking at this point, but they were still able to finish this test of endurance. I am hoping to be "IN" this picture next year as a participant, but we'll have to see how the training goes! As most of you know, they have been working on the expansion of Fantasyland for over a year. The new area will more than double the size of this land and contain many new attractions. This picture from last month was taken from the area in front of Snow White's Scary Adventures. Beyond the construction wall you can see the top of the Little Mermaid attraction. The construction walls will start coming down near the old Toontown Fair area next month. The first area is called Storybook Circus and will house two Dumbo rides as well as the Great Goofini Coaster and the new Fantasyland Train Station. Later this year, the Little Mermaid and Beast's Castle will open. Finally, we should see The Seven Dwarfs Mine Coaster opening sometime next year. Excitement is certainly building for what will certainly be a great new addition to the Magic Kingdom. You can find great memorabilia all around Walt Disney World. However, one of the best places is at "Walt Disney: One Man's Dream" in Hollywood Studios. This is an original Tron helmet used in the 1982 film. You can see that it is basically a hockey helmet with black tape. While visiting this attraction you can also see things like Walt's desk and the original Abe Lincoln audio animatronic figure. "One Man's Dream" is often overlooked, but I highly recommend checking it out the next time you are at Hollywood Studios! When Disney updated Star Tours to last year, they also did some fun things to the queue. This is a picture of RX-24 or "Rex" who was replaced by C-3PO as the pilot. Rex is seen here in a packing crate and he has a label on him marked "DEFECTIVE." He makes noises and tries to talk, but it sounds more like he is short circuiting. This is Disney's way of paying tribute to the original attraction. Rex was voiced by Paul Reubens, who is better known to most of us as Pee-wee Herman. I recently came across a brand new iPhone app that is rather unique. It marks the first time that I'm reviewing an app that requires the downloader to be at least 17 years old. When we think of Walt Disney World, most of us don't think of alcoholic beverages. However, there are many restaurants, lounges and even kiosks that serve adult drinks all around the Vacation Kingdom. You can find everything from fine wines, to margaritas, to hard liquor, but this great new app focuses on one type of beverage: BEER! The "Beers and Ears" app just came out last week and I think it is going to be a big hit. It comes from the group behind the Beers and Ears blog, which has been around for over a year. 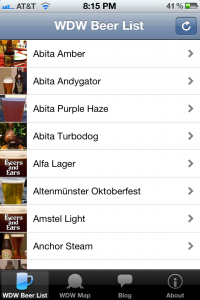 Essentially, the app allows us to see a list of all the different beers available at Walt Disney World. When you tap on the name of a beer, it gives you the place or places where you can find it. Then, when you tap on a location, it also lists the other beers available there. Many of the beers have pictures and some even have short descriptions. This is fantastic tool for finding your favorites when on vacation at Disney World. In addition to the "list" tab at the bottom of the screen, you will next find the "WDW Map." 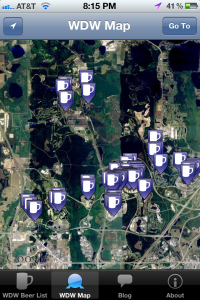 This brings up a satellite view of the entire property along with mugs depicting the locations where beer is available. You simply tap on a mug and the name of the restaurant or lounge pops up. You then tap on that location to once again get a list of the beers being served there. Like on the built in iPhone maps app, there is an arrow you can tap to show your own location on the map. This can come in handy when wanting to know which direction to go for your favorite beer. It is fun to zoom in on the World Showcase at Epcot and see all of the mugs encircling the lagoon. Although you may think of Germany or the U.K. as the obvious spots to grab a brew, each and every country offers beer in one form or another. It is also interesting to see that when you zoom into the Magic Kingdom, there are no mugs to be found. It is completely alcohol free. In addition to the beer locating functionality of this app, there are a couple more tabs. There is a link to the articles found on the Beers and Ears blog. Here you will find stories and more information about some of the beers found at Disney World. Finally, there is the "About" tab which gives users a quick way to contact the developers. Notices and acknowledgements can also be found under this tab. Although I'm not a big drinker, I think this app is going to be very popular. I enjoy a cold one every now and then and I'll be sure to use Beers to Ears on my next vacation. For anyone who is a beer lover, it is a "must have." It is a well put together app, and it is obvious that alot of time when into researching the content. I highly recommend downloading it even if you're not planning a trip in the near future. You can't beat the cost as it is absolutely free! This shot was taken while I was running the 5K last month. We were on a backstage access road at Epcot and this old Jungle Cruise boat was just sitting right there. I had no choice but to stop and take this picture of a classic attraction vessel that we were not expecting to see! I have absolutely no idea of why this single boat was just sitting there, but it was definitely interesting. There were many fun things to see while backstage at Epcot. Even if you are not a runner, the 5K is worth doing just for the experience. In honor of Super Bowl Sunday, I thought I'd post a Walt Disney World picture related to football. This shot of our little guy was taken at the All-Star Sports Resort back in 2008. You can see that he is sitting on large "X" that is in the football section of the resort. You can also see the gigantic helmut over his left shoulder. Although the All-Star resorts are considered "value," they still offer some great theming. Along with football, the All-Star Sports Resort has sections devoted to baseball, basketball, tennis, and surfing. Champion Stadium is located at the ESPN Wide World of Sports, right on Walt Disney World property. The stadium has over 9,500 seats and looks like a great place to watch a game. It is the spring training home of the Atlanta Braves. The players spend over a month here preparing for the season, and I have to think their families must like this location seeing as how it is right in the middle of the Vacation Kingdom! I took this picture when visiting the Wide World of Sports to pick up my race packet for Marathon Weekend last month. This is a close-up of the Walt portion of the Partners Statue in the Magic Kingdom. He is holding Mickey's hand who is out of the frame. The statue was installed in the center of the "hub" in the summer of 1995. If you zoom in on Walt's tie you will see a small emblem with the letters STR. This was the emblem of the "Smoke Tree Ranch." This is a working ranch and favorite getaway of the Disney family in Palm Springs, California. Walt built a vacation home at this resort where he would go to relax. He actually sold the home in 1954 to help finance Disneyland but purchased another one at the ranch in 1957, after the park was up and running. The STR emblem on the tie of the Walt statue is another example of a detail that is completely overlooked by 99.9% of guests. 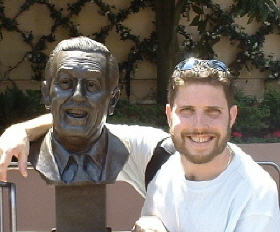 However, sculptor Blaine Gibson made sure to include it as he wanted to create an authentic likeness of Walt. He succeeded! It has been too long since I posted my last "full article." In addition to the "Picture of the Day," I usually like to share a feature article a couple times a week. However, I have been very busy working on a new project that directly pertains to this blog. Over the course of the last 13 months, I've enjoyed reviewing many websites that keep us connected to Walt Disney World. Today, for the first time, I'm proud and excited to feature a new website that I have created. It is called DisneyWorldDave.com. As many of you know, my passion for Disney World has been quickly building into more that just a hobby. In addition to this blog, I am currently involved in two additional Disney endeavors and working on another. Since all of these projects are related, it was time to consolidate them under one umbrella. Hence, DisneyWorldDave.com was born. It wasn't difficult to come up with my "brand" name as I've been known and Disney World Dave in the online community for more than a year. I was very happy to see that the website name was available. Now you can access all that I have to offer in one location, and I can truly be "Your Walt Disney World Connection." DisneyWorldDave.com is organized by tabs across the top of the page. In the "Home" section, I give you a quick description of who I am. The next tab is labeled "Vacation Planning." Back on January 1st of this year, I revealed that I had become a Vacation Planner with Mouse Fan Travel. For years, I'd been helping friends and family plan their trips and I am happy to be putting my experience to good use as a travel professional. Now when people contact me, not only can I make recommendations and put together custom itineraries, I can actually book their trips! After "Vacation Planning," you will see the "Guided Tours" tab. 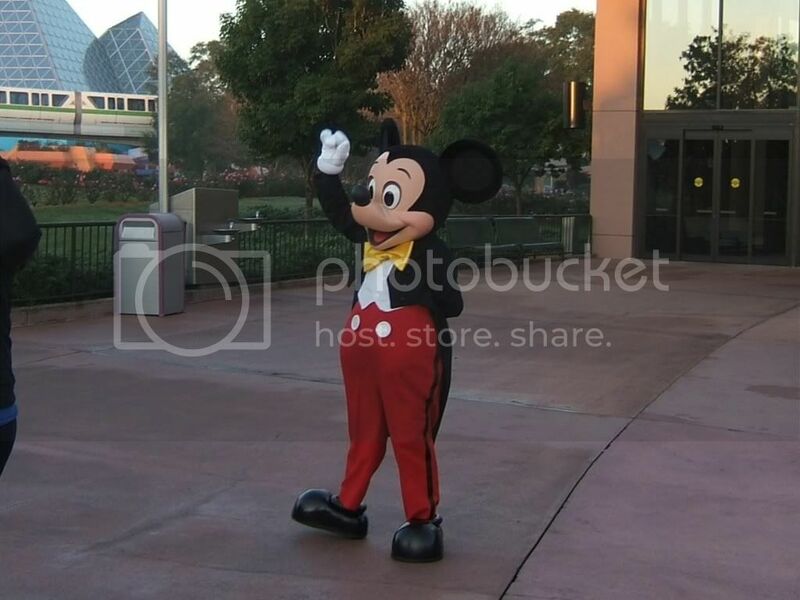 Along with my affiliation with Mouse Fan Travel, I also announced the creation of WDW Guided Tours on New Years Day. When I was a young boy, I envisioned myself working at Disney World someday. I decided to make that dream come true by expanding on an idea I've had for a while. With a background in teaching and the gift of gab (my parents say that I never stopped talking), I knew that I wanted to utilize my excessive Disney knowledge in a way that could help people get the most out of their trips to the Vacation Kingdom. My idea was to offer something unique and different that will help visitors see the most that Disney World has to offer if they only have a short amount of time. I am ecstatic to say that I'm now giving One-Day "World Tours" of all four parks. The next section of DisneyWorldDave.com is "Digital Disney World." This brings you to a description of the blog you are currently reading. Currently, the final tab takes you to the "Contact" section. Here you will find my email address and phone number. Although, DisneyWorldDave.com is online, it is certainly a work in progress and will continue to grow. Please feel free to contact me with any questions or comments. I hope that I can help enhance your Disney World experience in some way in the future. 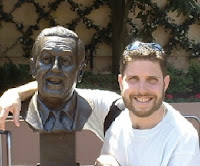 Whether you are looking to plan a trip, take a tour, or just enjoy reading this blog, thank you for letting me be "Your Walt Disney World Connection!" I love seeing and learning new things about Walt Disney World on each and every trip. Last month was certainly no exception. I shot this picture of the small world clock tower just after exiting our boat. Normally the doors are closed and you can't see the time displayed. However, every fifteen minutes they open to reveal the actual, current time. Here, it was obviously 11:00. The interesting thing is that most guests don't see this because the line for this attraction is typically under 15 minutes. In all the years I've been enjoying this classic ride, this is the first time I can remember seeing it. You can see the doors were just starting to close and I'm happy I got my camera out in time to snap this shot. I'm getting to feel like a gunslinger, as I've got time from camera "grab to shoot" down to approximately 2 seconds! Just outside of the Muppet*Vision 3-D attraction at Hollywood Studios, there is great shop called the Stage 1 Company Store. You will find a collection of Muppet and Sesame Street merchandise for sale in this location. You will also see great props, gags and other Muppet stuff all over the place. One of my favorite spots is the re-creation of the bus station lockers from the 1984 film The Muppets Take Manhattan. After arriving in New York, the Muppets live in these lockers at the bus terminal while searching for a producer to put on their show. I know I have written alot lately about the attention to detail that goes into almost everything at Walt Disney World, and the Stage 1 Company Store is another fine example.